Short and to-the-point, A Pocket Guide to College Success, offers practical coverage on the topics typically covered in a full-size college success text, from academic skills like managing your time, critical thinking, and note taking to life skills such as money management, stress reduction, and pursuing your career path. 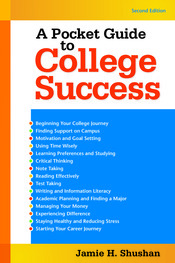 The second edition of A Pocket Guide to College Success provides additional support on the transition to college as well as features new coverage on motivation, mindset, and goal-setting to help students be successful from the start. With even more emphasis on asking questions, this text focuses on helping students ask the right questions to the right people so that they can drive their own college success. Each new copy of the text can be packaged with LaunchPad Solo for College Success, our online course space that includes videos, the LearningCurve adaptive online assessment tool, and more. A full package of instructional support materials provides instructors all the tools they will need to engage students in this course and increase student retention. Also available: ACES, a nationally norm-referenced student self-assessment of non-cognitive and cognitive skills.